NaBloPoMo and Movember are now fully a week old, and both seem like they're just getting started, and bound to get better every week. That said, I don't think I'll bore you with my thoughts on my inability to come up with Grade A blogging material and a passable moustache (happily dubbed "skeezy!" by Brianna), or even on the deconstruction of Gossip Girl and how, perhaps to my dismay, it's becoming an obvious combination of The OC and Dawson's Creek, and if the dialogue were delivered any quicker, it might also border on Gilmore Girls. But I'm not sure I'm ready for a confession posting of that magnitude just yet. 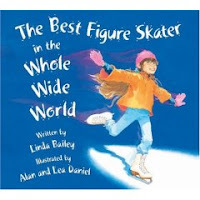 I will, instead, tell you about a great children's book that came home from the library the other day: The Best Figure Skater in the Whole Wide World. It's a story (a 'girl's story', according to Older Son when he wants his mother, and not me, to read it to him). The Lovely Wife is absolutely thrilled with this tale of a little girl who dreams big, practices diligently, only to be largely overlooked when it comes time for the big show. I can only surmise that somewhere in her childhood days, The Lovely Wife was forced to play a sheep in the Christmas pageant's nativity scene. This story, however, is a wonderful lesson in doing your part, even if it's not exactly what you wished for. When the Lizzy stretches the limits of her role as "tree", leading a forest of impossibly talented trees skipping and bunny-hopping off the ice, she's still a hit, receiving the adoration and praise of her mother, who doesn't seem at all miffed that the trees may have stolen the show altogether. So there: a lesson for parents, too. Highly recommended, and not just for men who watch girly TV and read books about figure skating to their sons. have i somehow been missing your movember photo updates, or are you just not posting your progress? i want to see the skeezy 'stache! No, Jenny, you have not. I've thus far been sparing the masses from the wispy Mo. Partially because I can't do magic in only 8 days... I promise, something will be coming up soon. Perhaps mid-month, or maybe tomorrow. Depends on how active the NaBloPoMo muse is this week. Being Shorty McShorterson, I was always the girl getting hurtled across the ice on the end of the precision team's pinwheel. I swear there were times when we went so fast that I saw my short life pass before my eyes.